Get the update on an overnight trip to the Chuckwalla Bench hosted by MDLT. The previous trip was cancelled due to flash flood in the area. The trip is being rescheduled. Discover one of the best-kept secrets of the California Desert — less than two hours east of Palm Springs, the Chuckwalla Bench is a spectacular landscape abundant with wildlife and rare desert plants. The Chuckwalla Area of Critical Environmental Concern (ACEC) is home to North America’s biggest and most intact old-growth microphyll woodland, as well as some of California’s best desert tortoise habitat. Now remote and peaceful, the Chuckwalla Bench also features a rich history of human activity, from prehistoric and traditional Native American cultural sites to historic gold miners’ trails. With hundreds of miles of trails and roads, across rugged mountains and sprawling vistas, there are endless opportunities for exploration. 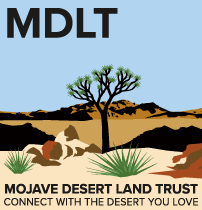 Mojave Desert Land Trust works with the Bureau of Land Management and other local partners to help protect this gem of the California desert and to share its beauty with the public.